TOKYO (AP) -- Sony is in talks to sell its troubled personal computer business and Thursday lowered its earnings forecast for the business year ending March to a 110 billion yen loss ($1.08 billion). The company also said it's cutting its global workforce by about 3 percent or 5,000 people by the end of March 2015 as it restructures its PC, television and other businesses. Some 3,500 of the job losses will be overseas and 1,500 in Japan. That comes on top of the 10,000 jobs cuts Sony announced over the previous year. The Japanese electronics and entertainment maker, battered by stiff competition from Samsung Electronics Co. of South Korea and Apple Inc., the U.S. maker of the hit iPod and iPad, acknowledged it won't be able to stop losing money in its Vaio PC or Bravia TV operations as it had repeatedly promised. Tokyo-based Sony Corp. said it will split off its money-losing TV division and run it as a wholly-owned subsidiary. Sony is talking with investment fund Japan Industrial Partners, which specializes in turnarounds and buyouts in manufacturing, to reach an agreement by the end of March to sell its PC business, both sides said in a statement. Sony declined to give a monetary estimate for the deal, saying a final agreement had not been reached. If the PC deal comes together, a new company will be established, both sides said. Sony has often been criticized as having too much under its wing, and analysts and investors have urged it to sell some of its operations for years. The moves announced Thursday might even be too little, too late. The maker of the Walkman portable recorder and Spider-Man movies kept its fiscal year sales projection unchanged at 7.7 trillion yen ($76 billion). But it lowered its earnings forecast, saying it will post a loss instead of the 30 billion yen ($295 million) profit expected in October. For the fiscal year ending in March 2013, Sony recorded a 43 billion yen profit. 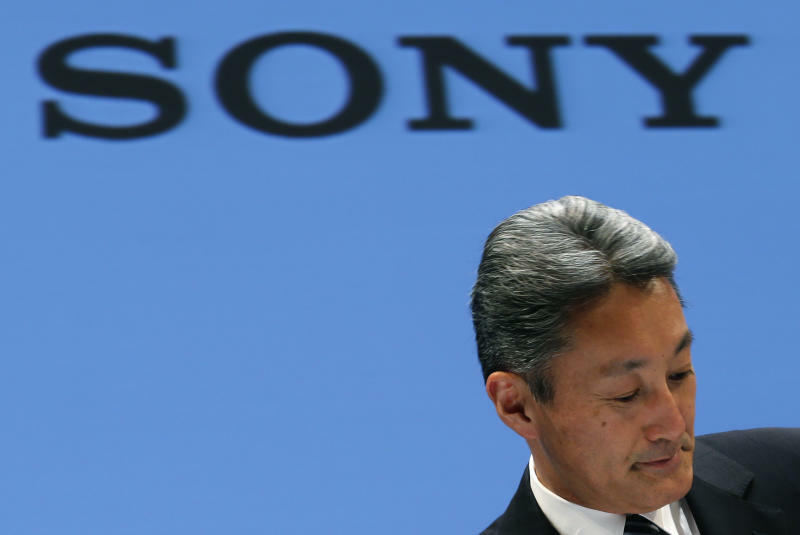 Sony CEO Kazuo Hirai told reporters the company's electronics business was gradually improving, but restructuring costs would send the company into losses for the fiscal year. He pointed to cloud-based gaming and TV services, a way of projecting images directly on walls for entertainment and other "Sony-like products," designed to not only deliver on basic gadgetry but also "woo people's emotions." In such network services, Sony faces tough competition from Apple, Google Inc. and other companies. "We are beginning to see the path to a turnaround in our TV business," Hirai said. "TV remains an important category for Sony." Sony posted a 27 billion yen ($266 million) profit for the fiscal third quarter, helped by improved sales, especially of its smartphones, and the launch of the PlayStation 4 video-game console, in addition to the favorable exchange rate. The dollar has been trading above 100 yen lately, up from 80 yen levels a year earlier. A weak yen is a boon for Japanese exporters such as Sony, rival Panasonic Corp. and Toyota Motor Corp. by boosting the value of overseas earnings. It reported a 24 percent surge in quarterly sales to 2.41 trillion yen ($23.8 billion). Sony had suffered a loss of 10.8 billion yen in the October-December quarter of 2012. Restructuring the PC and TV operations will cost Sony 20 billion yen ($197 million) in expenses for the current fiscal year, and another 70 billion yen ($689 million) in fiscal 2014, it said. But it's expected to bring annual fixed cost reductions of more than 100 billion yen ($984 million) from fiscal 2015. In Sony's entertainment business, the TV series "Breaking Bad" continued to be extremely popular, and its movie "Captain Phillips," starring Tom Hanks, has been nominated for the Best Picture Oscar, although it did not have as many blockbusters as in 2012. Its music business contributed to earnings through releases such as Beyonce's new album, which sold 2.3 million units globally in December when it went on sale. The PlayStation 4 has been doing well, totaling 4.2 million units of console sales and 9.7 million in software sales. It went on sale outside Japan in November, and is set to arrive in Japanese stores Feb. 22.